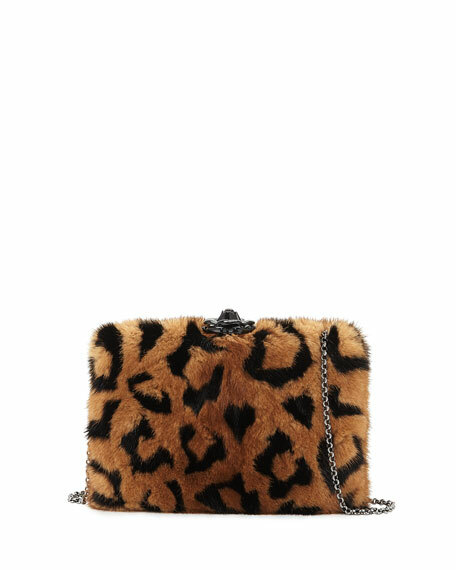 Oscar de la Renta "Rogan" clutch bag in dyed mink (USA) fur. Chain strap can be tucked inside. Hinged top with pavé crystal rose ornament. 5.1"H x 7.7"W x 1.4"D.
For in-store inquiries, use sku #2388637. 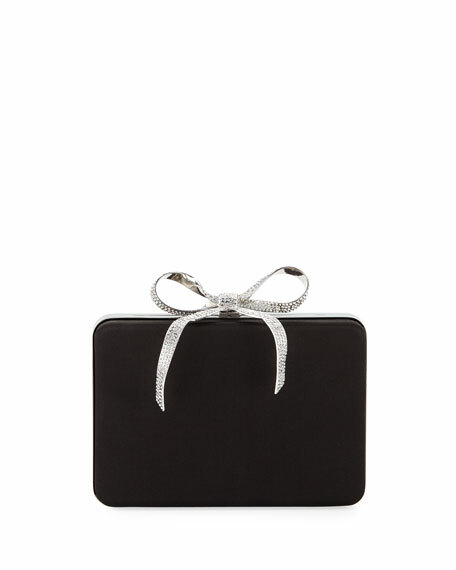 Oscar de la Renta soft satin minaudiere clutch bag. Removable chain shoulder strap, 5.1" drop. Framed top with push-lock closure. Exterior, crystal bow at top. Contrast lining; one card slot. 5.1"H x 7.7"W x 1.4"D. Made in Italy. 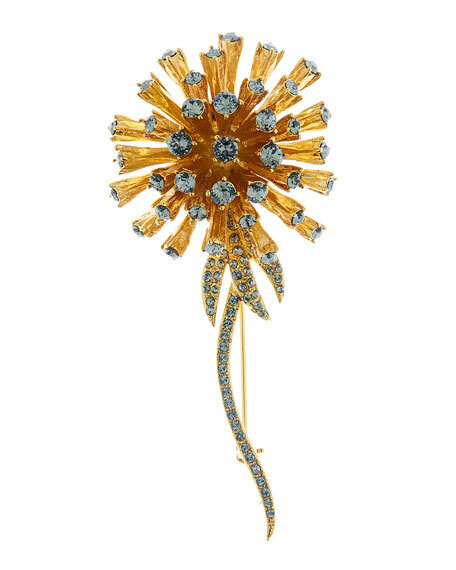 Oscar de la Renta crystal dandelion brooch. Polished pewter hardware and settings. Clear crystal accents. Safety pin closure. Approx. 3"H; 1"W. Made in USA. 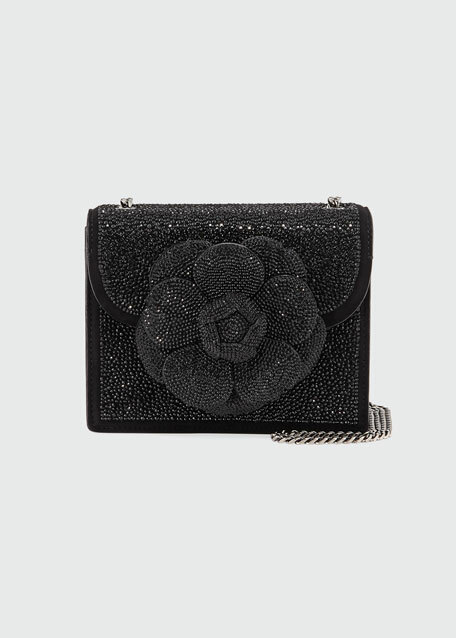 Oscar de la Renta "TRO" suede crossbody bag with Swarovski crystals. Chain shoulder strap. Flap top with flower appliqu center. Push-lock closure. Interior, suede lining. One slip pocket. 5.3"H x 6.7"W x 3.2"D. Made in Italy. 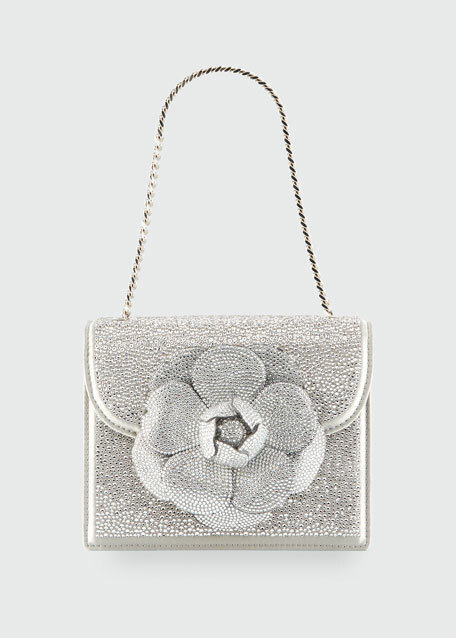 Oscar de la Renta satin crossbody bag covered in Swarovski crystals. Chain shoulder strap. Flap top with gardenia flower appliqu center. Push-lock closure. Interior, suede lining. One card slot. Made in Italy.